Want to connect with Edward's? Communication: We communicate appointment scheduling, invoicing, estimates, and more by phone and email to keep our customers “in the loop”. 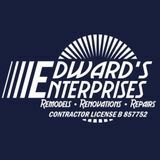 Established Company: Edward’s Enterprises has been a locally owned & operated small business since 1996. Licensed: We are a licensed General & Plumbing Contractor with the Contractor’s State License Board (B,C--...) since 2005. Insured: Insured to protect our residential and commercial customers as well as our employees. Skilled Team: Our hourly service calls are handled by experienced, long term employees in the field and in the office. Responsive: Available by phone and email, our team is responsive to our customers and will communicate with you before, during, and after your project. Clear Information: We explain our hourly rates on our website and by phone before we schedule any work so that you know what we charge. Our rates start at $99* for the first hour of each trip and $69 an hour after that (that’s for 1 employee) depending on city.